Google acquired yet another social gaming company: SocialDeck. The start-up had an interesting idea: creating a platform for playing games on any device. "SocialDeck was founded in 2008 with the vision of enabling 'anywhere, anytime, anyone' gaming. The company has launched several titles for the iPhone, Facebook, and BlackBerry using its social gaming platform technology, which enables simultaneous game play across multiple mobile devices and social networks," explains SocialDeck's site. It should be obvious that Google doesn't buy companies like SocialDeck to develop games. Most likely, Google wants to create a platform for social gaming that will enable users to play the same game on an Android device, on an iPhone, on a computer, on a Chrome OS tablet, in Google Me or any other social network that uses Google's platform. 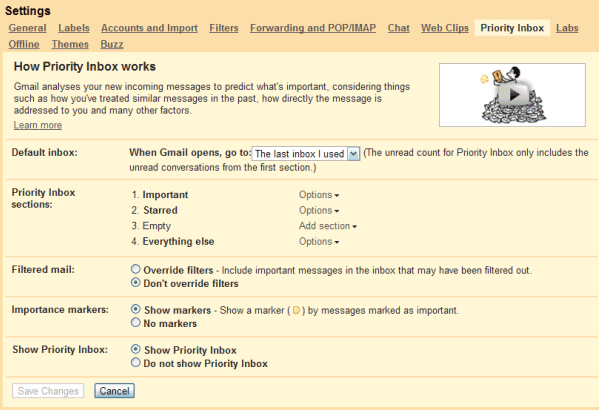 Last year, I posted about a new Gmail feature that will prioritize important messages. 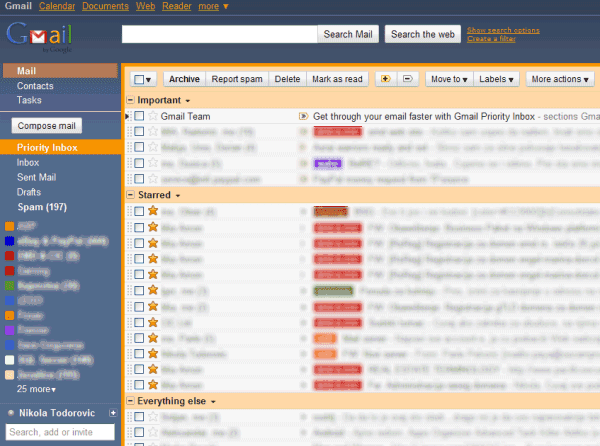 This feature will be available soon and it's called Priority Inbox. "Priority Inbox is a new view of your inbox that automatically helps you focus on your most important messages. Gmail has always kept spam messages out of your inbox, and now we've improved Gmail's filter to help you see the emails that matter faster without requiring you to set up complex rules. Priority Inbox splits your inbox into three sections: Important and unread, Starred, and Everything else. Messages are automatically categorized as they arrive in your inbox. Gmail uses a variety of signals to predict which messages are important, including the people you email most and which messages you open and reply to (these are likely more important than the ones you skip over)." Gmail also adds two buttons that let you classify messages as important or unimportant, just like the "Mark as spam" and "Not spam" buttons. Unlike spam filtering, finding important messages is more difficult because you can't use information from other accounts to classify messages. Google has to build a personalized classifier for each Gmail user and it needs a lot of messages. "Email importance ranking works best for people who receive a lot of email," explains Google. Google takes into account implicit signals like: the messages from people you frequently email are important, if a message includes words frequently used in other messages you usually read then it's probably important, the messages you star are probably more important than the messages you archive without opening. There are also explicit signals: click on the important/unimportant buttons, create filters to mark messages as important. Priority Inbox will be available in Gmail and Google Apps over the next week, but you'll only see it in Google Apps if the administrator has enabled "pre-release features". Tidbit: Gmail uses the "important" label to classify messages, so that's the reason why you can't create a label named "important". 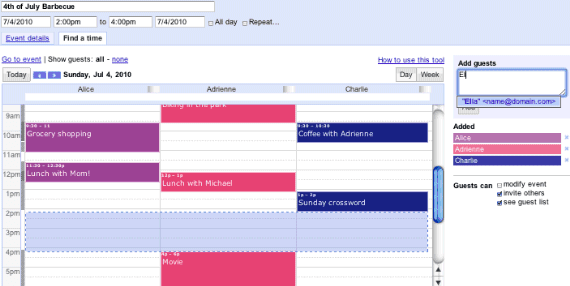 Last year, Google Calendar tested a feature that made it easier to schedule events with guests. The "sneak preview" was only available for a few months, but now it's back. Google calls it "find a time" and you can use it when you create an event. "If you're able to view your guests' calendars (via sharing, Google Apps shared access, or because they've made their calendars public), you'll be able to compare schedules and pick a time that works for everyone," explains Google. 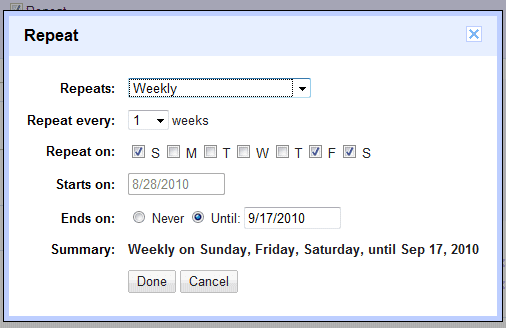 Google Calendar redesigned the page that lets you create events and added a more intuitive dialog for repeating events. 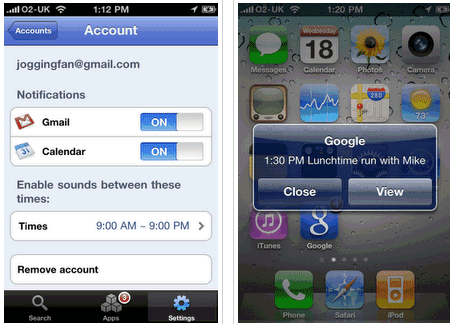 "The old interface for creating recurring events was clumsy and took up too much space on the screen," admits Google. "Now you'll see only a summary of your recurring event on the main event page; if you want to edit it, you can use a window that opens when you select the 'Repeats' checkbox." Warning: This tip is only for Gmail users outside US. Google says that the latest Gmail feature that allows you to make phone calls is only available in the US, but that's not true. 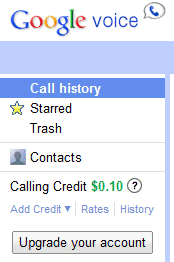 If you set Gmail's interface language to English (US), you should see the "Call phone" option in the chat roster. You can also buy credit using Google Checkout. If you're not in the US and you want to add credit to your account, make sure that you DON'T CLICK the "Upgrade your account" button from Google Voice. 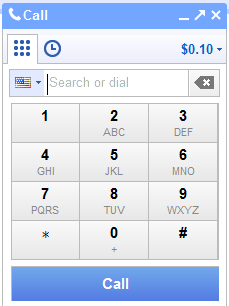 This feature is only useful if you are in the US, since it lets you get a Google Voice number. Unfortunately, if you click on that button and you're not in the US, you'll no longer be able to buy credit. I don't think there's a way to downgrade your account, so the best thing to do is to avoid clicking that button. Google could easily solve this problem by hiding the button for non-US users or by allowing users to stop the upgrade. Update. You can cancel the upgrade if you use a US proxy (try UltraSurf if you use Windows). Update 2. A Google spokesperson said: "We're looking into this and will keep you updated." 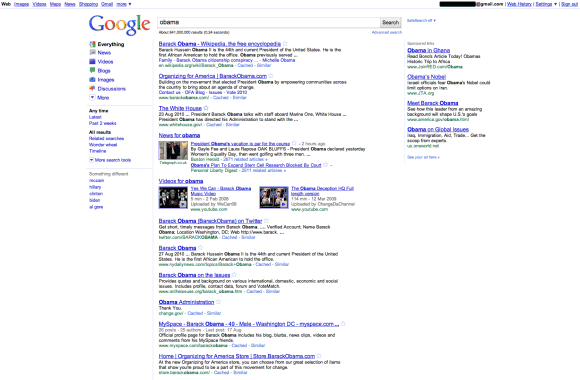 Some users report that Google started to test a centered layout for search results pages. It looks almost like Yahoo Search, except that the navigation bar isn't properly aligned. The experiment could be related to the "live search" interface that adjusts the results as you type a query. 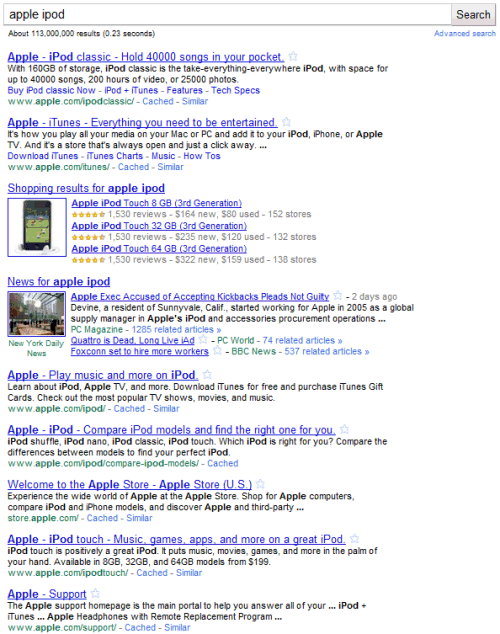 Google's search results could become an extension of the homepage, which already has a centered layout. Google Realtime Search was only a section of Google's search sidebar that allows you to restrict the results to Twitter, Facebook, Google Buzz and other sites where you can post public updates. Now it's a full-fledged service that has a homepage, a logo and a name. 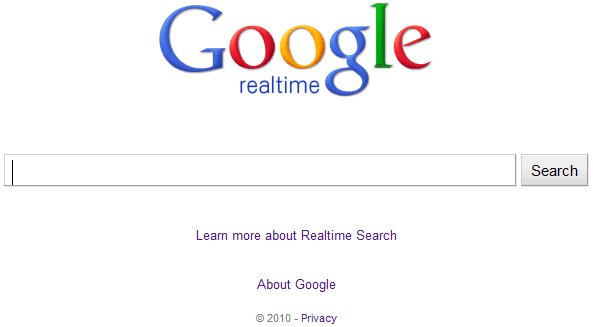 Even if Google Realtime's homepage is at google.com/realtime, you'll miss two important new features if you don't go to this special URL: filtering results by location and showing the context of a message using a conversation view. Restrict search results to a location to find out what people from a certain place think about a topic. "You can use geographic refinements to find updates and news near you, or in a region you specify. So if you're traveling to Los Angeles this summer, you can check out tweets from Angelenos to get ideas for activities happening right where you are," suggests Google. If one of the search results is part of a conversation, Google shows a link to the full conversation. "Often a single tweet sparks a larger conversation of re-tweets and other replies, but to put it together you have to click through a bunch of links and figure it out yourself. With the new full conversation feature, you can browse the entire conversation in a single glance." Google also added a new feature to Google Alerts: updates, which is another name for realtime results. It's not a good idea to choose the "as-it-happens" option because you'll receive a lot of email alerts. Google has recently released a licensing service for Android applications that is supposed to make it more difficult to pirate paid apps. The service is not yet part of the operating system and it works by sending a query to Google's servers in order to determine if the user has bought an application. Android Police found that it's quite easy to circumvent Google's verification, especially if the application's code is not obfuscated. "Because the License Verification Library is not part of the Android OS, an app developer needs to package it with the app that uses it, making it an easier patch target, without requiring root access. (...) The method is so simple, even a novice programmer could write a script to automatically patch most apps." Google's Tim Bray responded by saying that "the first release shipped with the simplest, most transparent imaginable sample implementation," which didn't focus on security. He recommends developers to obfuscate the code and to use other implementations. Tim Bray also says that "the best attack on pirates is to make their work more difficult and expensive, while simultaneously making the legal path to products straightforward, easy, and fast. Piracy is a bad business to be in when the user has a choice between easily purchasing the app and visiting an untrustworthy, black-market site." Tim Bray's answer is ironic, if you think about it. 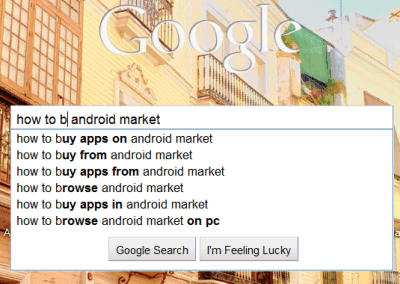 Google's Android Market lets you install paid applications only if you are in one of the 13 supported countries. The "legal path" is neither "straightforward, easy, or fast" if you don't live in one of the 13 countries that are supported. Maybe instead of focusing on developing anti-piracy services, Google should add more locations to the paid Android Market. 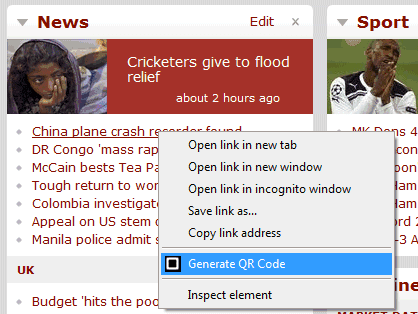 Chromium's blog announced that extension developers can add custom actions to the context menu, now that this feature is available in Google Chrome 6 Beta. "The new context menu API allows extension developers to register menu items for all pages or for a subset of pages. 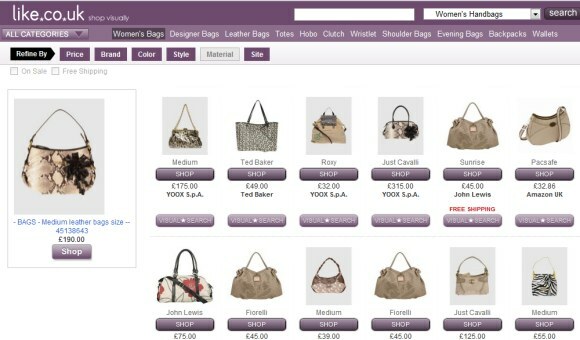 Developers can also register menu items for specific operations, like right-clicking on an image or movie. For example, you could create an extension that makes it easy for users to share interesting images from images.google.com with their friends on Google Buzz." * QR Code Generator, which generates a QR code from a web address (right-click on a link, select "Generate QR code" and use Barcode Scanner for Android or another application to scan the code). * Imgur Uploader, which uploads images to Imgur. * TweetRight, an extension that lets you share images, links, webpages and selected text on Twitter. You can try these extensions if you use Chrome 6 Beta, Chrome 6 Dev Channel, a Canary build or a recent Chromium build. Chrome 6 supports two other APIs for managing the browser's cookies and detecting when the computer's idle state changes, but there other interesting changes. Orkut, Google's social network that has a lot of users in Brazil and India, has received a major update. Groups of friends are more visible and you can send messages to the members of a group directly from Orkut's homepage. 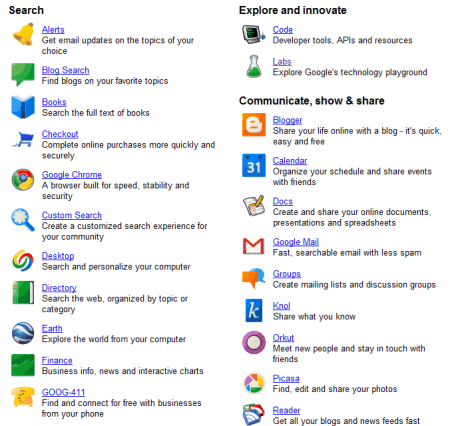 Orkut also updated search results pages and application pages, while testing a new platform for communities. There are a lot of changes and it will be interesting to see if Google tests these features in Orkut before launching Google Me, a social network that will compete with Facebook. One of the major changes in Orkut is the focus on groups. "You love your grandma and you're friends with your boss, but that doesn't mean you want them both seeing the conversation you're having with your friends the day after a party. With orkut, you can now build separate groups of your friends reflecting how you interact with them in real life." This is one of the ideas from "The Real Life Social Network", a presentation by Paul Adams, Senior User Experience Researcher at Google. Google's Rahul Kulkarni mentioned last year that Orkut will change a lot. "The new Orkut adopts the latest Google Web Toolkit platform and includes features such as built-in simultaneous chat, photo tagging with automatic face detection and private sharing of photo albums including new safety features. This is the beginning of a new direction for Orkut, where users will be able to increasingly share and communicate with groups of friends from their lives." Gmail tweaked the interface two weeks ago and many users complained about the links to the contacts manager and to Google Tasks, which are now displayed at the top of the page, above the Compose button. If you rarely use the contact manager and you don't need a task management app inside Gmail, the two links can become annoying. Google added a small button that lets you collapse the group of links, but the setting wasn't preserved when you reloaded the page because of a bug. Now you can permanently hide the links to "contacts" and "tasks". 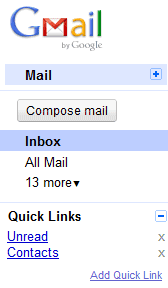 If you ignore the blue bar at the top of the page and you don't click on "Mail", you'll no longer see the two links. Gmail could add an option to move the horizontal navigation bar below the list of labels, even as a Gmail Labs experimental feature. I partially solved this problem by enabling "Quick Links" in Gmail Labs and adding links to the contact manager and to a mail view (is:unread). Another option is to use this userscript that moves the links below the labels. The script should work in Firefox (Greasemonkey is required), Chrome and Opera. 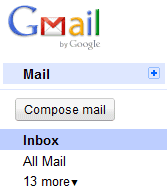 "Gmail is home to a few different apps, including Mail, Contacts, and Tasks. The links on the left below the app navigation change depending which app you're using, while the app navigation links remain consistent so that you can go between apps. If you're in the Contacts app, the big action button becomes the way to add a new contact. We use this button as the way to create things in other products like Google Docs and Google Calendar, too." You might have noticed that Google Calendar has a new favicon that replaces a monthly calendar with a daily calendar. Google Calendar is not the only Google services that has recently updated the favicon: Google Sites and Google Translate have new shortcut icons and it's likely that many other Google sites will use the colorful images from this page. I rarely use the native email clients from Android and iPhone. Gmail's mobile web app has a better interface and it's easier to use than those applications, but there are some limitations that force you to switch to the native apps: you can't attach files and there's no support for notifications. Until mobile browsers add support for these features and integrate with the operating system, native apps will continue to be more powerful. The latest version of Google Mobile App for iPhone solves one of these issues by adding push notifications for Gmail and Google Calendar. You no longer have to use Google Sync to get notifications when you receive an email message or an event is about to occur. "Now Google Mobile App can help with push notifications from your Google account to your iPhone -- an icon badge shows you’ve got new mail in Gmail, and Google Calendar event reminders appear right on your home screen." After updating Google Mobile App 0.6, it seems that Google only shows a badge when you get a new message, just like the native mail client. Update: Google's mobile blog says that "you will only receive pop-up messages and sound/vibration for calendar alerts - new email is shown using the unread count on the Google Mobile App icon and in the apps tab". You probably remember the name "Caitlin Roran" from Gmail's promotional pictures. Many screenshots from Gmail's help pages showed messages received from people like Caitlin Roran or Nathan Wood. Gmail's fictional characters are now at Facebook. Someone spotted Caitlin Roran and Nathaniel Woodward in Facebook's privacy page. Go to Facebook privacy settings, then choose "Custom" and click "Customize settings." 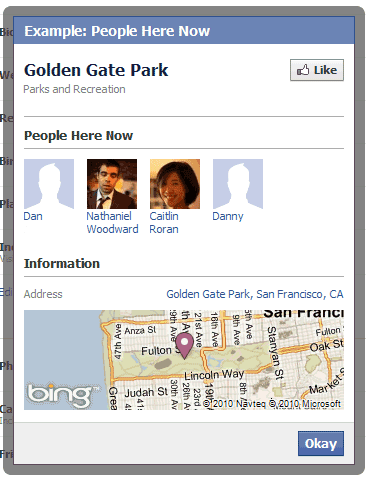 Under "Include me in 'People Here Now' after I check in," click "See an example." You should see some of your friends, plus Caitlin Roran and Nathaniel Woodward. It's worth pointing out that Paul Buchheit, the ex-Googler who created Gmail, is now a Facebook employee and he's not the only former Gmail engineer who works at Facebook. According to Christopher Harley, Caitlin Roran is a fictitious name used by Ana Yang, while Nathan Woodward borrowed Casey Muller's photo. Ana Yang and Casey Muller got married last year. "Ms. Yang and Mr. Muller met in May 2008 while working at FriendFeed, a startup social networking Web site in Mountain View, Calif. 'I was the first employee hired,' said Ms. Yang, who enjoyed being part of the hard-working, fun-loving group. They spent 10 to 12 hours at desks in a cavernous work space in which they also rode bicycles and played Ping-Pong. She loved sports, yet her colleagues, though all male, were not big fans. Then Mr. Muller joined the company, which was sold to Facebook in August, and told her how much he liked basketball." "Before FriendFeed, Ana worked on product marketing at Google for four years, leading Gmail marketing for three years," mentions FriendFeed's site. Don't miss this brilliant story about Caitlin Roran found in a Wikipedia page that has been deleted. Picasa 3.8 makes it easier to upload pictures for your Google contacts. After scanning all the photos from your library and adding name tags to your photos, you can go to the Tools menu, select Upload and click on Upload People Thumbnails. Picasa asks if "you want to upload and replace all the thumbnail photos from your People Albums to your Google Contacts". If you click on "Upload", Picasa saves the photos to Google Contacts and you can see them in Gmail or in any other application that synchronizes with Google Contacts (for example, Android's Contacts app or iPhone's Contacts app, if you use Google Sync). If you don't want to upload photos for all your contacts, you can click on one of the people from Picasa's sidebar, right on a photo and select "Set as Google Contacts Thumbnail". You can also enable "Upload people album thumbnails to Google Contacts" from Tools/Options/Name Tags (or Picasa/Preferences/Name Tags on a Mac) to upload the new thumbnails you select in Picasa. It's strange to see that Google didn't add this option to Picasa Web Albums and that the photos tagged in Picasa Web Albums aren't displayed in Google Contacts. Google could at least offer the option to pick one of the photos tagged in Picasa Web Albums when you add a picture to one of your contacts. Right now, you can only select a photo from your public albums. 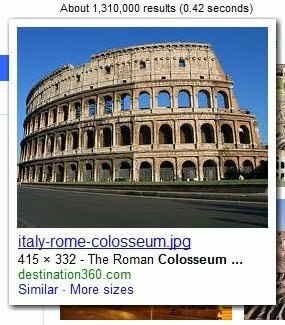 Google Image Search added a feature launched by Bing in March: showing more sizes for each result. If you mouse over an image, there's a new option called "more sizes" that lets you find other versions of the same image. This is useful if you want to find higher-quality version of an image or if you want to list all the sites that include a certain image. 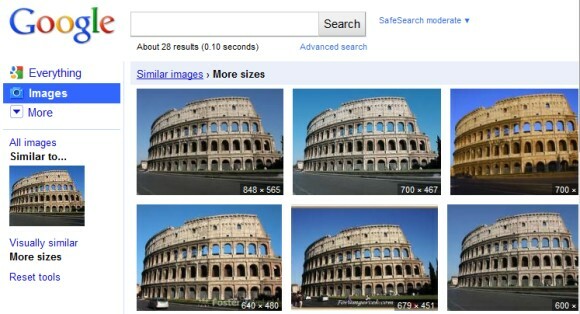 Most likely, Google uses the same technology that lets you find similar images, but restricts the results to images that are almost identical if you ignore the resolution or some minor editing. 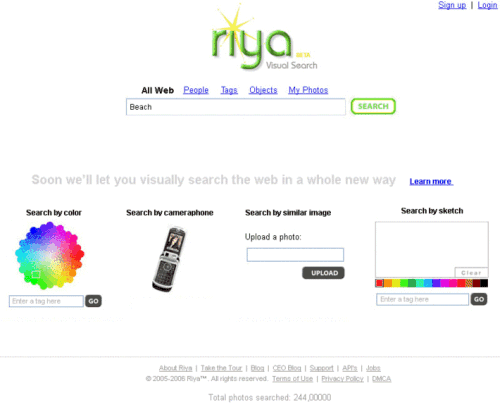 A similar service is TinEye, a search engine that finds different versions of an image you upload. "TinEye is a reverse image search engine. It finds out where an image came from, how it is being used, if modified versions of the image exist, or if there is a higher resolution version." 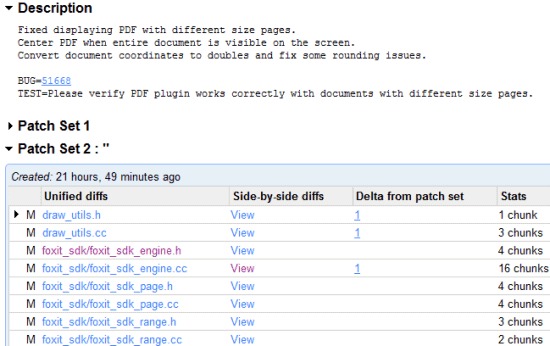 Google Chrome's built-in PDF plugin uses Foxit PDF SDK. As you can see from this page, there are many references to Foxit's SDK, which is a proprietary set of tools that allow applications to read or modify PDF files. "With the incredible small size (less than 2MB) and amazingly fast speed, Foxit PDF SDK (DLL) 2.0 is your absolute choice to develop your own PDF applications," suggests Foxit. Google decided to include two of the most popular plugins (Flash and PDF) in Google Chrome to make the browser more secure. The PDF plugin runs inside Chrome's sandbox so that vulnerabilities can no longer install malware on your computer. The Flash plugin is automatically updated by Google and it's likely that it will run inside Chrome's sandbox in the future. Google Chrome 5 already includes the Flash plugin, while the PDF plugin is available in Google Chrome 6 (dev, beta and soon in the stable channel). 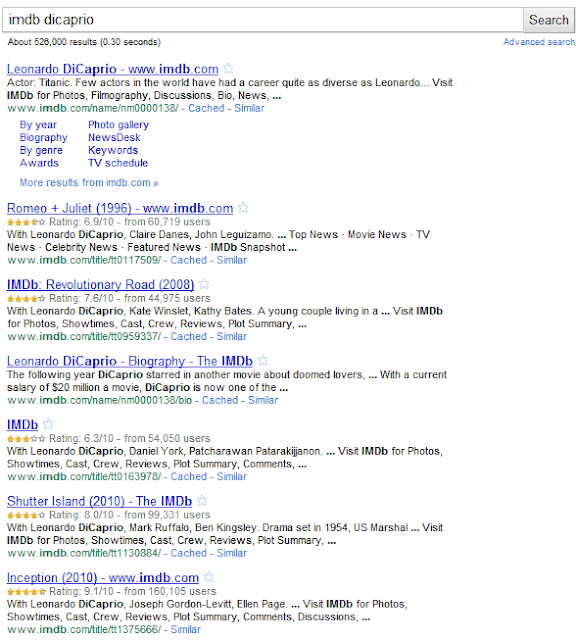 Google tests a new search interface that updates the results as you type a query. In this experiment, you never have to press Enter or click on the "Search" button to see the results because Google constantly retrieves the results for your query. While this interface has the advantage that you can refine your search faster, the constant refreshing can be annoying if you don't need help. Rob Ousbey calls this experiment "live updating Google search results", Google uses the word "streaming", while others may call it instant search or incremental search. Google probably wants to morph the search box into a query builder with instant preview. Check the HD version of the video to better see Google's new UI. 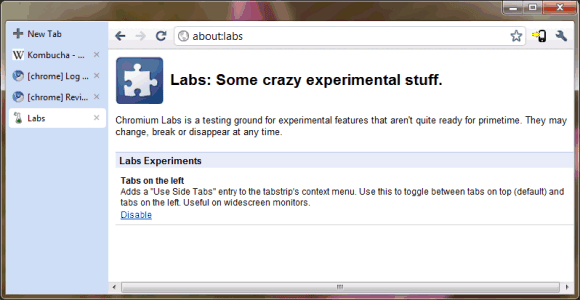 The experiment is not available in Google Labs, but you can try a similar interface at Google Alerts. Type some keywords, click on "preview results" and every time you change the search terms, Google Alerts shows a preview. There's also Keyboardr, a site that uses Google AJAX API to shows results as you type. Update: Another user noticed the changes. When you visit Google's homepage and start typing your query, Google moves the search box at the top of the page and displays the results. "Open the Google page and start typing. Previously, the screen didn't shift. Now, though, as soon as you start typing, Google shifts the search box to the top of the page, and displays ads to the right and distracting search results below." The new UI can be disabled by clicking on "turn off streaming" next to the search box. Garrid Lou spotted a new user interface for Google Translate, which shows examples of news sites that can be translated and other Google products that use Google Translate. The new interface replaces the long drop-down of languages with a multi-column list and moves the translated text to the right. 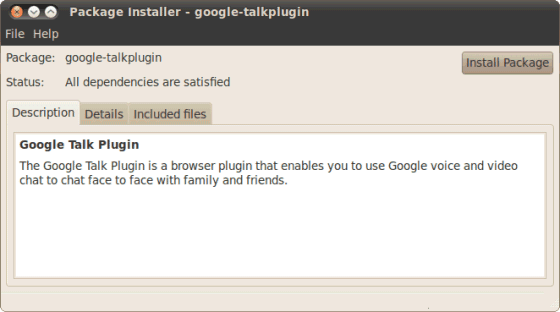 After two years of waiting, Gmail's plug-in for voice and video chat is finally available for Linux users. "Voice and video chat for Linux supports Ubuntu and other Debian-based Linux distributions, and RPM support will be coming soon," says Tristan Schmelcher, from Google. Justin Uberti says that adding Linux support was really difficult. "This release required significant engineering to develop an all-new video rendering solution and an all-new PulseAudio-based audio handler, along with work to support 64-bit and countless webcam compatibility tests. We spent a lot of effort to make it fully feature-complete, with all the same goodies as the Windows and Mac versions, and we're happy to now support Google voice and video now on all major desktop platforms." Now that video chat is available on Windows, Mac and Linux, when will it be ported to Android? 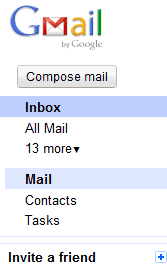 Gmail updated the interface last week and many people complained about the changes. Some didn't like Gmail's new hybrid button for selecting messages. To select unread messages or starred messages, you need an extra click. Apparently, many Google employees hated this change, as well. It IS odd. And yet, both the checkbox and the menu part tested very well in the lab. The people who hated the widget outside the lab also understood how to use it but promised others wouldn't b/c it was so "weird." We tried a few things (like putting the select actions under "More actions") but I didn't have high hopes for any of them except the widget that launched. It tested better than I had hoped (all of the participants in the usability study were able to select all, unread, and none). We launched it to all Googlers months ago and listened to feedback (everyone was able to figure it out... some just hated the change). More about why the change: The "Select all" link is used by <1% style="font-weight:bold;">I wanted to simplify the interface and give back that space to users. Since features like "select unread" or "select starred" were used by a lot less than 1% of the users, it made sense to hide them. Power users can always learn how to use keyboard shortcuts and an extra click doesn't mean too much for a feature that's rarely used. Michael Leggett also says that the link to Buzz will be added at the top of the page, next to Contacts and Tasks, and users will be able to hide the links to service they don't use. Google Spreadsheets added spell checking, but it doesn't find misspellings automatically, like in Google's word processor. You need to click on the Tools menu and select Check spelling. Google starts to find mistakes and suggests corrections from the dictionary. Unfortunately, you can't add words to the dictionary yet and Google's suggestions are sometimes terrible. 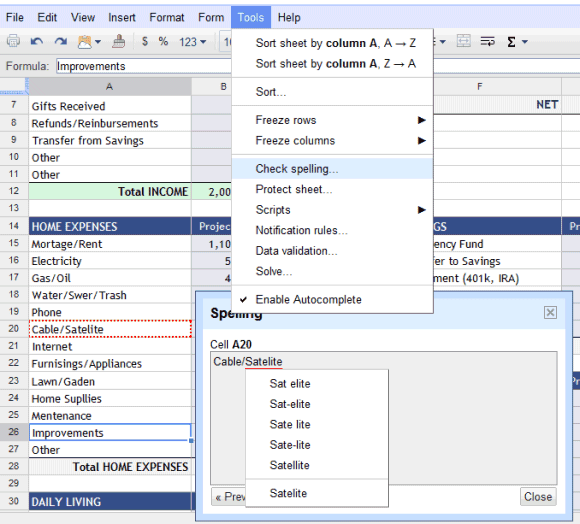 "The tool will go through all the cells on your sheet, highlighting each cell which has a misspelled word in red. Words that might be misspelled in each cell are underlined in red and can be changed by clicking on them and selecting the right spelling," explains Google Docs blog. Google should replace the dictionary-based spell checker with the context-sensitive spell checker that's already used in Google Wave and Google Search. Instead of using a dictionary, this spell checker extracts data from web pages and Google searches to find a statistical language model, much like Google Translate. This model allows Google to predict mistakes and to determine the most likely corrections. After clicking on "Report a bug", Google shows this message: "Please scroll until the issue becomes visible. Next, click anywhere in the window to take a screenshot." 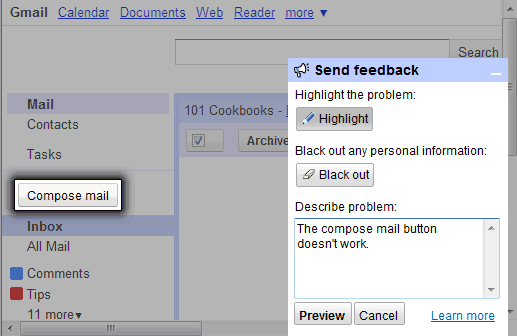 Click in the window and Gmail loads a new page that lets you highlight the problem, black out personal information and describe your problem. It's a really cool feature which will probably be added to other Google services in the near future. Picasa 3.8 doesn't add too many features, but there are at least two reasons for updating to the latest version: Face Movie and batch upload to Picasa Web Albums. Face Movie is a movie presentation centered around one person. "As the photos transition from one to another the subject's face stays aligned in one focus area, creating a unique viewing experience," explains Picasa's blog. 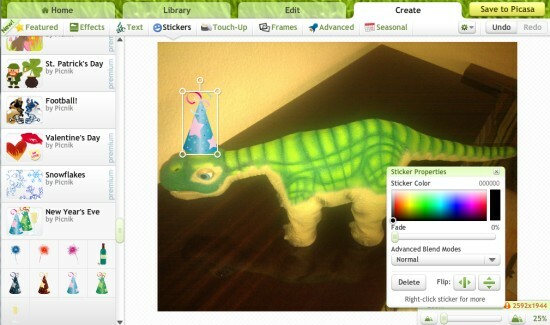 Just select one of your contacts from Picasa's sidebar and click on the create Face Movie. 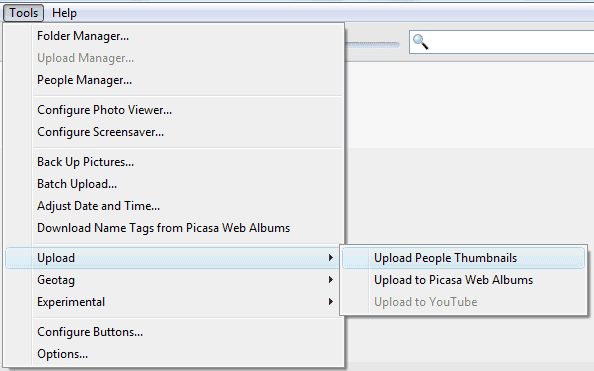 Picasa 3.8 makes it easy to upload multiple albums to Picasa Web and change the settings for the existing albums. You can delete multiple albums, change their visibility, save space by changing photo size or disable syncing. Go to the Tools menu and click on Batch Upload to access this feature. Google's photo manager also added a surprising feature: integration with Picnik, the online photo editor acquired by Google this year. Why would you use a slow and limited online service to edit photos stored on your computer, when you can use Picasa's image editing options? Picasa's help center explains: "Use Picnik's exclusive editing features to apply effects, stickers, and frames to your photo. You can also crop, and adjust the colors of your photos right in your browser. When you click on Edit in Picnik, your photo will be transferred online. Apply the desired effects then click Save to Picasa. You'll have to option to replace your original photo or create a new copy on your computer." 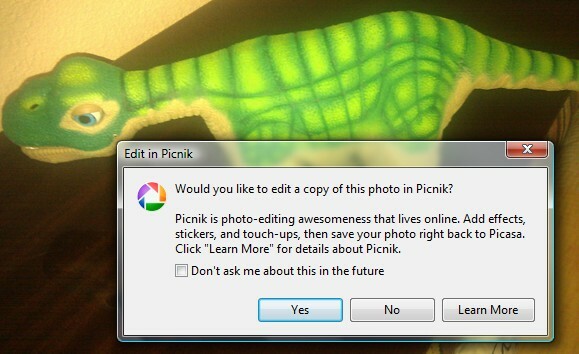 In Windows, Picasa uses an Internet Explorer object to display Picnik's Flash site. I had to click on two Internet Explorer script error messages before uploading a photo to Picnik. Unfortunately, most Picnik stickers and touch-ups require upgrading to Picnik Premium. Why would Google charge users $25 a year for this service? I remember that Google made Blogger Pro, Picasa, Keyhole's Earth Viewer (now Google Earth), Urchin, Sketchup, FeedBurner Pro/MyBrand free after acquiring the products.